I'm delighted to announce that today is the third anniversary of the Pre-Shortzian Puzzle Project, and all the proofread puzzles are now in! Three years ago I started this blog and opened up the litzing, which I'd begun during my freshman year, to volunteers. I had a great head start, thanks to the digitizing Barry Haldiman, Denny Baker, and others had already done of their favorite puzzles back in the day, and was able to systematize and massively expand the effort so that, one puzzle at a time, each of the available 16,225 puzzles would be tracked, litzed, and proofread. 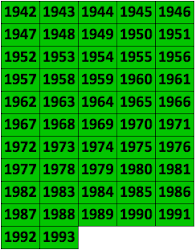 And with the help of Jim Horne, creator of the incomparable XWord Info, these puzzles have gradually appeared online, year by year as we worked our way backwards through time, for everyone to enjoy. 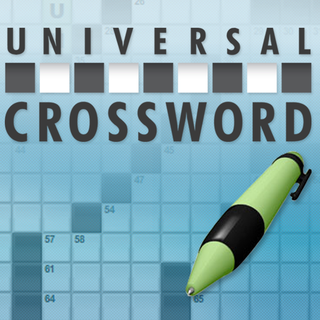 Thanks so much again to everyone who's helped with this journey into crossword history! Without each and every one of you, there's no way we would have come so far so quickly. Though I still have to look through the remaining years of proofread puzzles before sending them off to XWord Info and do quite a bit of "cleanup" work with constructor names and previously posted puzzles, this is another huge milestone in the project! 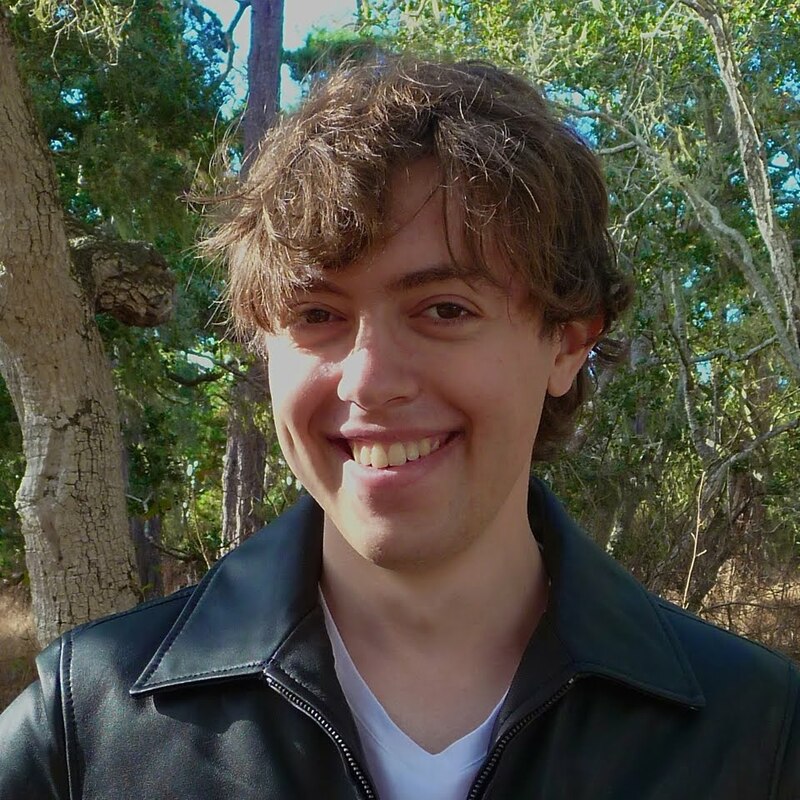 The final two batches of proofread puzzles came in over the past two weeks—the first on Thursday the 18th from Todd Gross, who sent 13 puzzles in which he'd found 89 mistakes. (Todd also has a puzzle in today's New York Times, by the way, which he co-constructed with Andrea Carla Michaels and with which he's hit for the cycle—meaning he's now had a puzzle published on every day of the week! Congratulations, Todd!) And then on Friday the 26th Patsy Stewart sent in 12 more puzzles, marking the end of the proofreading—at least until the missing puzzles are found! Thanks so much again, Todd and Patsy! 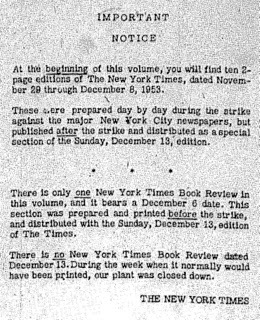 Notice: A strike affecting the major New York newspapers made it impossible to publish any editions of the New York Times during the first eight days of December, 1953. THE NEW YORK TIMES Book Review dated December 6, which was prepared and printed before the strike, was distributed with the Sunday, December 13th issue. 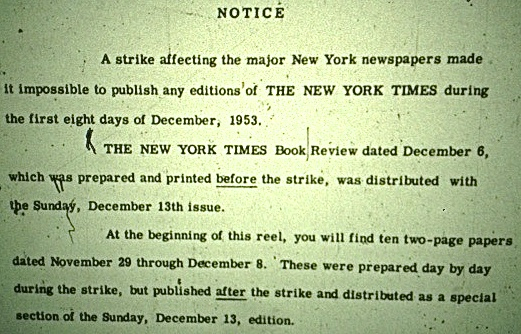 At the beginning of this reel, you will find ten two-page papers dated November 29 through December 8. These were prepared day by day during the strike, but published after the strike and distributed as a special section of the Sunday, December 13, edition. Photos courtesy of the American Library in Paris. Alan had not yet heard back from the National Library of France, and apparently the British libraries, although technically public, require an annual fee in order to use them or ask questions. He did end up hearing from the National Library of France, though, and in a second e-mail wrote to me that the situation there was the same as at the American Library in Paris. National Library of France response. Courtesy of the National Library of France. So, unfortunately, this is likely a dead end, at least with these nine days of missing puzzles. I'm planning to be update the complete list of missing puzzles before I head off for Stanford (where, as a student, I may actually be able to access the British libraries), and when I do, I'll post it on this site. Although we've struck out so far with this select group of missing puzzles, there are many others, some of which are missing not because of strikes but because of ProQuest's errors. So I'm still hopeful that eventually some, if not all, of the puzzles will be found. 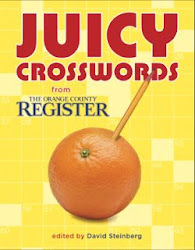 I'll also be putting out another call for those missing old crossword books—again, as soon as I've had a chance to update the list—which I think may be our best bet for locating the missing puzzles, even if we're never able to match up the dates definitively. In the meantime, thanks so much again, Alan, for these valiant efforts! Mark Diehl Seven-Time Blast! Winner! Now that I'll be posting on a more occasional basis, I've decided to retire the Blast! feature, so the official champion is Mark Diehl—congratulations again, Mark! 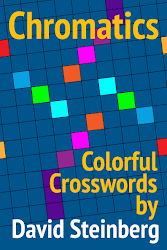 As I mentioned in my last post, I recently gave an ideacity talk in Toronto about crosswords, and part of it was about the Pre-Shortzian Puzzle Project. 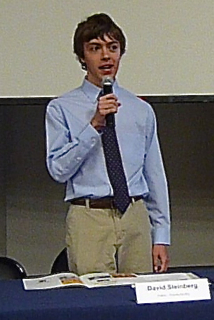 People really seemed to enjoy the speech—I probably had a couple of hundred people come up to me over the course of my amazing three days there asking me more about crosswords and the project, which was very gratifying! While there I was also interviewed by a reporter from a Russian publication, and another reporter plans to interview me when I'm in Vancouver at the upcoming National Puzzlers' League convention, so I'm hoping to spread the word even further. (Maybe I should just move to Canada!) In any case, to see a video of the talk, click here. Just a few days after returning from Toronto, I headed up to Reno, where I'd been invited to be a panelist at the Davidson Young Scholars Summit. Since the Davidson award I received in 2013 was for the Pre-Shortzian Puzzle Project, that's what I was asked to discuss, and I spent quite a bit of time describing the initial stages of the project, how things had developed, challenges I'd encountered, the project's current status, and what the puzzles might show us in the future. Having a chance to talk to so many interested students and parents was really gratifying, and I think they appreciated hearing about something as fun as crosswords!